In the current issue of Reader’s Digest, former Saturday Night Live cast member, Tina Fey, takes some shots at The Daily Show and its wildly popular host, Jon Stewart. Fey says Stewart makes audiences clap more than he makes them laugh. Yeah right, that’s why SNL had to use a laugh track (er, “audience-enhanced track”) when Tina Fey hosted Weekend Update. And God knows nobody at Saturday Night Live ever played up to the audience for applause. 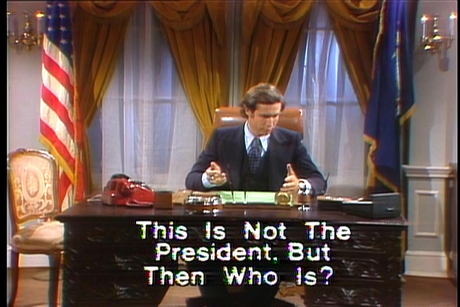 Hell, Chevy Chase’s whole schtick was falling down while impersonating Gerald Ford. And he only INVENTED Weekend Update. In 2007, Fey was nominated for an Outstanding Actress in a Comedy Series Emmy for her role in 30 Rock. In 2008, she won the Golden Globe for Best Actress in a Comedy or Musical. And Fey won a Screen Actors Guild Award for Outstanding Performance by a Female Actor in a Comedy Series in January. Fey is also the current star and creative force behind NBC’s 30 Rock making her one of the most important women in the television industry. The show itself won the 2007 Emmy for Outstanding Comedy Series. Unfortunately, all of the awards and acclaim mask one very important fact about Tina Fey. SHE’S NOT FUNNY. In a decade of watching her on tv I can remember exactly 0 times that she made me laugh. And unlike multitudes of her fellow SNL alum, Fey created exactly 0 memorable characters. Besides, if Fey wants to use making people laugh as a measure of success, well then she’s NO KIRSTIE ALLEY. After all, Fey is part of the current NBC lineup that has taken two generations of Must See TV and turned it into just another Thursday night. It’s laughable that Tina Fey would give Jon Stewart comedic or anchoring advice when she wasn’t even as good as Dennis Miller. Hell, Fey was upstaged on a weekly basis by Jimmy Fallon. Actually, if you think about it, the Readers Digest comments were probably the funniest lines she EVER delivered. And just why would the brains behind the moribound and TRULY UNFUNNY 30 Rock (the woman was the 14th best person to do Saturday Night Live Weekend Updates) feel compelled to give advice to anyone. Let alone a guy who’s revolutionized a format that she was a part of? An entire generation now looks to Jon Stewart and Stephen Colbert as their primary source of news and information. Stewart is featured in Time, Newsweek, Entertainment Weekly and People Magazine. Advertisers are clammering, BEGGING to be a part of his show. All generations find Tina Fey irrelevant. Fey appeals to the over-60 Hillary Clinton demo that never got around to getting cable and is still stuck watching network tv. The Readers Digest demo if you will. You are currently browsing the archives for the Tina Fey category.